That’s the first thing you read on the website from which Audacity can be downloaded. It’s also a simple, fast and free way to manipulate audio files for music practice. I have often mentioned Audacity at the session–I’m finally getting around to explaining how to use it. This is going out especially to my session posse! Holla back! Import and edit recordings I have made of our session tunes. Export the session tunes as MP3s to make them easy to up-and download. Speed up and slow down recorded music files–without changing the pitch. Change the pitch of a recorded audio file (transpose to another key). Select a section of recorded audio and play it as a loop. Select, copy and paste a section of recorded audio to create a new file. What I’ll do today is explain how I do a couple of the most common things I do–selecting audio, slowing it down, and playing it looped (so that it starts over automatically). There are much more extensive step-by-step tutorials on the Audacity website HERE. Once you have downloaded Audacity and have the program open, you can go to the file menu at the top and select import>audio. Or you can drag and drop the file directly onto the open Audacity window. It’s just a visual representation of the audio you’ve imported. You can press the space bar to play the audio, and watch as the cursor tracks across the waveform. You’ll notice that when the sound is louder, the waveform appears taller. With your cursor, you can click on the waveform, hold the mouse button down and drag the mouse across the waveform and you’ll notice you’re creating a shaded area–this is the part you’re selecting. You can copy, cut and paste this just like you would text, but for now we’re just going to play with it. Don’t click on the waveform again or your selection will disappear! Now that you’ve managed to select some audio, we can do all sorts of fun things with it. Let’s slow it down, to start with. I know the thought of using a metronome for Irish trad probably elicits any number of reactions from any number of people, but hear me out. Today I did just that. I’m learning a fairly difficult tune–Cooley’s reel–and wanting to do more than just play the notes. I’d like a few well-placed cuts and rolls, cranns and chords in there too. 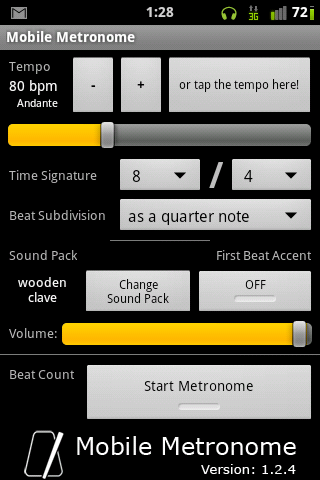 The metronome I used is an app for Android phones called Mobile Metronome–it’s free from the Android market and does what you need it too. I started at 80 beats per minute (bpm). That was way too fast, so I took it down to 75. Still a bit brisk. Down to 70 bpm–AHA! perfect. Easy to keep up, easy to throw in a few “ornaments” as some call the twiddly bits that make Irish music sound Irishy. The hard part was sticking to the beat, but tapping my foot along really helped in that regard. So after about 30 minutes of playing along with 70 bpm I bumped it up to 75. Hey–no problem. I actually was easily able to keep up, put in my ornaments, and keep tapping my foot along. Fifteen minutes later and I was playing at 80 bpm. Then, just for laughs, I tried it without the clicker AS FAST AS I COULD. I actually was playing it at nearly dance speed with some issues, but one of them was NOT continuity–I was able to keep playing, tapping my foot, adding ornaments. Buried under the other instruments in a session you’d probably not know I was messing up a bunch! So, now that I made you read all that, the short of it is that practicing to a metronome for one hour can really improve your timing, continuity, and fluidity. Start slow enough that you are not making many mistakes and work your way up. Strive for accuracy right from the start, and keep playing the tune through over and over again (as Corey suggested last session). And make sure you TAP YOUR FOOT, because you’ll want to be doing this ANYTIME you play–with or without the metronome. Do this a few times each week and the benefits will move from the short term to the long term!